Chocolate Chip Cookie Dough Pop-Tarts are fantastic as a candy bar substitute. They hold up untoasted as well as toasted. As a breakfast pastry, my only complaint could be fairly disputed by different taste buds - they're just too sweet. In an untoasted state, you do get a distinct flavor of chocolate chip cookie dough. Toasted, the flavor closely resembles the smell of cookies in the oven. The chocolate chip specks melt and the result is a real treat. The inner texture of the Pop-Tart is a little different than the other Pop-Tarts we've tried. It's firmer and creamier - think of a custard-filled doughnut versus a jelly-filled doughnut. 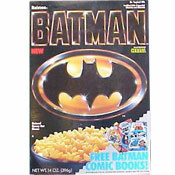 It's a good time for toaster pastries, both Quaker and Kellogg's have been experimenting extensively in recent years. Some of the new flavors work. Some don't. In the bigger picture, these companies should collect their marketing data on flavors like this and "Hot Fudge Sundae" and launch all-out full-throttle campaign to grab a bigger piece of the candy bar market. I'd pick this Pop-Tart over most candy bars any day. But for breakfast, give me a breakfast pastry where I can have the illusion I'm not starting my day with dessert. What do you think of Chocolate Chip Cookie Dough Pop-Tarts? When you heat cookie dough, it turns into a cookie. Not so with this... it's still cookie dough even after toasting. Not bad. Didn't taste like cookie dough though. Smells similar to S'mores flavored Pop Tarts right out of the wrapper and I don't know if it's just me but it had a very slight floury taste to it. I also didn't see many "chocolate chip" pieces in the filling. I had it straight out of the package, not toasted. Maybe toasting it will yield a more cookie dough taste. I eat a pack every day! I love Cookie Dough Pop-Tarts. Just ate some. A Pop Tart is yummy for my tummy. I eat them everyday honey. 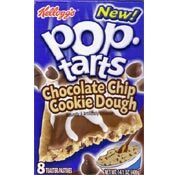 I never knew they made this kind of Pop-Tart, I'm really excited to now go to the store and buy some of these! Yeaaaah boi! The people who burned themselves are hilarious. Also, these pop-tarts are great out of the box. You are sooo soo true Mr. Breakfast! Most of my family has dubbed this poptart too sweet! But, I the person with the lowest sweet tolerance have fallen in love with them. They are a delightful midafternoon snack. And are perfect for slow summer days. They are a triumph of the pop-pastry world! I love eating these from the freezer. I love these. I eat this almost everyday. Very tasty. They taste good both toasted or right out of the package. I like the vanilla milkshake poptart but its kinda too sweet but its still good. Possibly one of the best Pop-Tarts ever made. The only thing is that they can be a little bit too sweet but its ok I still love them anyway. This flavor of Pop-Tarts has a golden pastry crust topped with chocolate frosting and squiggles of vanila frosting and also features an interior of chocolate chip cookie dough filling usually packaged in pairs untoasted. If toasted, the filling tastes like real chocolate chip cookie dough. I still rate this flavor of Pop-Tarts world-class to everyone. These pop-tarts are my favorite to have for breakfast. They're not too sweet and kids love them. These are the best pop-tart flavor. Hands-down. I thought these pop tarts were tasty but a little too sweet for breakfast. Wonderful as a dessert! I actually thought they tasted more like a graham cracker. It was good but it does it taste like cookie doug? No, no, and no again! Pop-tarts are a simple and easy breakfast, or just daytime snack. There are many different varieties to choose from, and you all have your own opinions. Pop-tarts are easy to send with the kids anytime and are quick for on the go needs. Pop-tarts are simply easy and not difficult. Absolutely disgusting! I tried the Pop-Tart and and spit it out immediately... way too sweet and just the same as a candy bar for breakfast! I hate these pop-tarts. I like poptarts they taste good in my mouth but not in my hands! They r ok s'more pop tarts r the best though. I think this kind of pop tart is ok.
Feeeeearrrrrr meeeee! I am the poptarts monster!!! mwa hahahahahahaha!!!!!! *eats a poptart* U guys r (crazy)! Could it be possible that when u put pts in the toaster, it gets hot????? duhhhhhh! Get a education (people)! These are excellent when they are frozen. You guys are joking, right? Do you really think Mr. Breakfast manufactures poptarts? They just review them. You should contact Kelloggs if you're reallly burning your fingers and lips on poptarts. Or better yet... you should contact a behavioral psychologist. I also got burned from it!! Except it was because I touched something HOT and watched where I stuck my fingers. As a parent, you ought to take caution handling pop tarts, as they are VERY dangerous to the public. I am now typing this email to you by the hunt and peck system because my first two fingers have second degree burns from your product. I usually heat the pop tarts in my toaster oven, but last week the toaster oven broke, so yesterday I used the regular toaster. In the process of pulling out the pop tarts when they were heated, the icing adhered to my fingers and when I felt the pain pulled the tarts off my skin. As an initial reaction I put my hand to my mouth and also burnt my lips. I went to the doctor who told me I have second degree burns and gave me a tetanus shot. I am now bandaged and am not able to function at my job on the computer for at least a week. Since this is a product geared toward children, I think there should be a large warning label on the box alerting that a dangerous situation can occur if the proper precautions are not taken. Also, as my son was dressing my wounds he reminded me of an incident in the neighborhood a few years ago when a toaster oven was left unattended with pop tarts cooking and the house went on fire. Please, since this is a new flavor and many children will be trying them, send a warning to the parents and children as soon as possible.